1 What Do American Robins Look Like? 3 What Do American Robins Eat? What Do American Robins Look Like? Both males and females are a deep gray-brown, with warm rust-colored bellies. Their heads are much darker than the rest of their bodies and during flight, a white patch on the underside near the tail can be spotted. The most distinguishable difference between the two sexes is that the females have a slightly lighter colored head than the males. Robins are considered a large songbird and with their easily identifiable round bodies, longs legs and long tails, are often used as reference points when comparing the size and shape of other birds. Widespread across all of North America, robins are commonly found in gardens, parks, yards, golf courses, fields and pastures. They also live in less developed spaces like deciduous woodlands, coniferous forests, shrublands and forests in regeneration after fire or logging damage. They can also be found in the tundra, their range extending well up into Alaska. During the winter, they tend to move toward moist woodlands where berries are more abundant. However, populations in the American arid southwest tend to avoid well-watered lowland shrublands throughout much of the summer. Very few other bird species share the robin’s ability to live in both wild and anthropogenic centers with such ease. What Do American Robins Eat? Robins might be known for eating worms out of lawns and gardens, but their diet is wide and varied. Fruit actually accounts for nearly 60 percent of the American robin diet annually. In early spring and summer, it is true that their diet consists mainly of earthworms as well as snails. But as the season progresses, they also consume numerous different fruits like chokecherries, hawthorn, dogwood, sumac fruits and juniper berries. One scientific study suggests that robins may try to select fruit containing insects to round out their diet. Although much rarer, robins have also been known to eat shrews, small snakes, and aquatic insects. In addition to seasonality, robins also eat different foods depending on the time of day. In the morning they eat more worms and move on to fruit as the day progresses. As robins tend to forage mostly on lawns and other swaths of human development, they are vulnerable to pesticide and chemical poisoning and can be an early indicator of environmental distress. Robins tend to bounce a few times over the ground before abruptly stopping to stare at the ground. Although it was thought for many years that robins were able to hear earthworms under the ground, it is now known that they in fact locate them by site. They can often be found fighting over worms caught by other robins. When landing, they tend to flick their tails downward multiple times, and stand very straight with their beaks tilted slightly upward to watch their surroundings. Although many people associate robins with the beginning of spring, many populations are not migratory and stay within their territories year round. In the winter they tend to spend more time in trees and less time on the ground, so they may be spotted less in yards and other public spaces making it appear that they migrate and return. 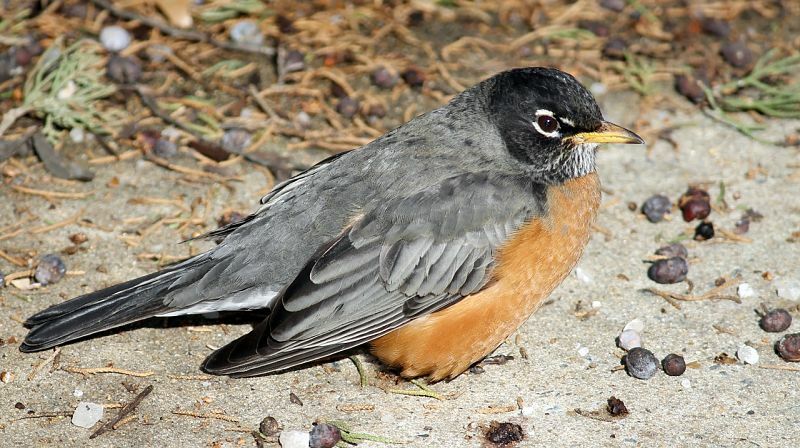 In the winter, robin roosts can grow in excess of a quarter-million birds in which they gather to look for berries and other large collections of fruit. In spring, during the breeding season, males will attract females by singing, raising their tails up and down, shaking their wings and inflating their throats. As the robins pair up, the males and females will open their bills wide and touch them to each other. Once with a mate, the females will begin the process of building out the nests. The female robin prefers horizontal branches hidden by a dense canopy of leaves about five to 25 feet above the ground and rarely more than 70 feet. 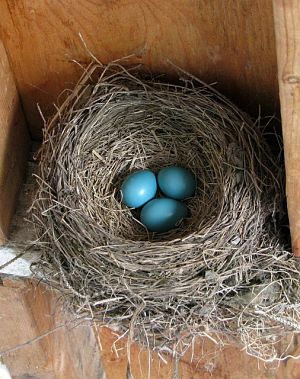 Robins will also nest on the sides of houses, gutters, light fixtures, barns and bridges. In the American southwest they have been known to build their nests on the ground and in Alaska will build them on the sides of cliffs. Unlike other birds, robins build their nests inside out, starting with the delicate inner cup made with dead grasses and twigs by pressing them against the wrist of their wings. The female will add in paper, feathers and moss to soften the cup. After this she will build out the rest of the nest with mud from worm castings which produces a soft, but firm and sturdy nest. The last of the nest is lined with dry, fine grass. In the end the nests are typically 6 – 8 inches across and 3 – 6 inches high. The female typically lays three to five eggs which she incubates for up to two weeks. The nestlings, which are born helpless and mostly naked remain in the nest for another two weeks. Both parents work to feed the young a diet consisting mainly of earthworms and other insects. The males will often continue to care for the nestlings toward the end of the two weeks while the female begins another brood. Although robins have the ability to produce up to three broods a year, only 40 percent of nests successfully produce offspring, and only 25 percent of those offspring survive through the summer. After that, only about 50 percent of those robins will survive through the winter to the following year. Regardless, the oldest robin on record was nearly 14 years old. Even with those rough odds, the American robin population has been growing over the last few decades, with a global breeding population of nearly 310 million. Of those, 79 percent spend some of the year in the U.S., 45 percent spend some of the year in Canada and 13 percent spend some of it in Mexico. Hey Buddy!, I found this information for you: "The American Robin". Here is the website link: http://backyardbirdingblog.com/american-robin/. Thank you.